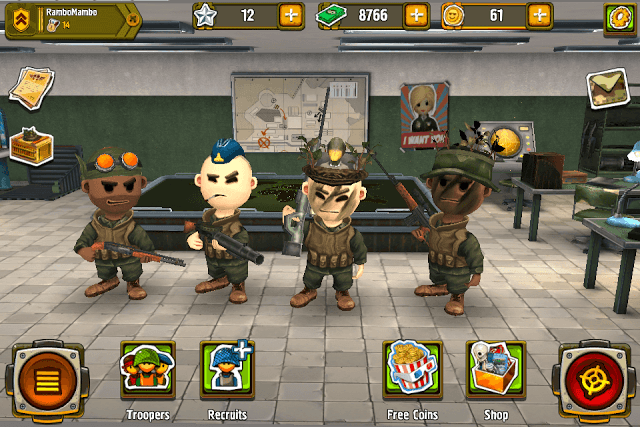 Pocket Troops is a war-themed turn-based tactical game from Heyworks. The game lets you lead a rag-tag team of rookies to fight enemy squads and defeat a black color-loving villain who wants to rule the world and make everyone wear black. You can hire new recruits to your squad, train them and equip them with skills and weapons. There’s also different types of “rooms” and equipment that lets you unlock additional stuff that can make your army more powerful. Battles are standard turn-based affair. You have to tap on your trooper and then tap on the enemy trooper to order attacks. Having the right squad and trooper combination is crucial to win battles. With the help of these tips, hints and strategies, you will be able to win solo and PvP battles and build a stronger squad. The more soldiers you have in your army, the harder it will be for enemies to defeat them. You will need to upgrade the Rec Room via Shop to increase army size. After upgrading, go to “Troopers” and tap on “Free Slot”. You will be taken to the recruitment center where you can recruit a new soldier to your army. 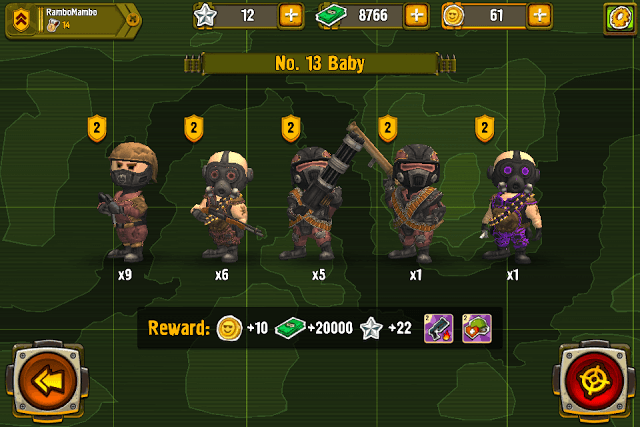 Just make sure you have different types of soldiers, long range, short range and medium range troopers, in your army. Tap on a recruit to know more about him. Next tap on his primary weapon to discover its key attributes like Damage, Range, Accuracy and Ammo. Have a balanced army consisting of troopers that have high-range, high-damage and high-accuracy guns. Try to choose a trooper who has HP/armor/accuracy or attack rate higher than the rest of the recruits. Special troopers can be bought for coins, whereas others can be purchased with cold hard cash. Once you have recruited a trooper, use stars earned in battle (PvP or solo missions) to get skills. Under inventory, tap on the empty slot to get a skill or weapon. Chances of getting an identical weapon or skill are more. You can drag and drop duplicate primary weapon or skill to your original primary weapon or skill to unlock its special abilities. Once ability is unlocked, it can be upgraded further by combining same-type weapons/skills. A weapon or a skill with all abilities unlocked can really help you take down tougher enemies in battle. Just before start of battle, the mission screen gives you a glimpse of troopers which you may encounter in a battlefield. Examine each member of the enemy trooper squad. Tap on an enemy trooper to check his damage/attack rate and other attributes. Next, tap on his weapon portraits to know their range and damage. Don’t start the game. Go back to your base and choose those soldiers with weapons that have high damage/accuracy/range. If the enemy squad has more troopers equipped with low range weapons such as rifles, shotguns or melee weapons, have a squad with more long range troopers. Short range troopers have to come closer to the enemies first and then shoot them. Having more long range troopers (snipers, mini-guns, rocket launchers etc.) in your squad will make it easy for you to eliminate short range shooters or reduce their HP considerably even before they run towards your squad and attack. You may also have a balanced squad consisting of long and short range troopers, but just make sure your squad should be set according to the enemy squad set-up. Next, train your selected troopers so that their stats are at the same level or higher than the enemy troopers you examined in the mission screen. Training costs cash and may take some time, but then you get a stronger squad. With each new step, the total training time increases. Upgrade Exercise machines to train more than one unit at the same time. Training boosts your soldier’s health, armor, accuracy and attack. After selecting the right trooper according to the enemy squad setup and trained each soldier in your squad, you are now ready to face enemy troopers. When you start battle, order troopers with high-accuracy long-range weapons to take out short range assault rifle/shot gun equipped troopers. Tap on your soldier and then tap on the enemy soldier to attack him. Eliminate shot gun-equipped troopers with your long-range troopers as their “Damage” dealt by them is huge and can kill your soldiers instantly with one or two shots once they come closer. Mini-gunners can be a good option, so can be rocket launchers but the latter deals less damage. Some sniper rifles such as the L96 have great Damage, Range and Accuracy. Expect more misses than hits if your trooper has a low accuracy gun. With a low-damage gun, it will take a couple of shots before your trooper can take down an enemy trooper. You can replace your weaker troopers with newer ones, but you will need to “Dismiss” them first. Tap on a weak trooper or a soldier that isn’t contributing much to a battle and then tap on the “File” tab to dismiss him. Once kicking out a trooper, you can’t recruit him. Certain skills can boost your trooper’s damage, health and accuracy and other attributes. “Helmet” is one example. Equip your trooper with a helmet skill to increase his armor by 10 or more points. This will ensure he does not die early in battle. Drag identical helmets to your equipped helmet to level it up and increase your armor stats further. “Hardy” is another example. It gives an HP bonus to your trooper once you have equipped it. The “Regeneration” skill restores 5 percent health per turn. You can get all the above skills using stars. Tap on the star boxes in your trooper inventory to discover them. Some skills can deal additional damage to enemy troopers. Example: Flash bang. A trooper equipped with a Flash bang will throw it at the enemy causing “Blindness”, which can reduce your enemy’s target accuracy by a certain number for 2 or more turns. Upgrade Flash bang to increase accuracy reduction. There are skills that can defend against enemy skills. “BKB” is a good example. Having it equipped will make your soldier immune to Flash bang explosions. BKB also has additional abilities that can be unlocked after upgrading it. One of them is Fireproof that can decrease fire damage to your soldier. Keep playing solo and PVP battles, earn stars and use them to discover new skills at the inventory. You can move unwanted weapon or skills to your Armory or sell them for stars by dragging them out of your inventory. Upgrading rooms and equipment has several benefits that will directly or indirectly affect your army in a good way. For example, upgrading the REC room will allow you to recruit more troopers to your squad. 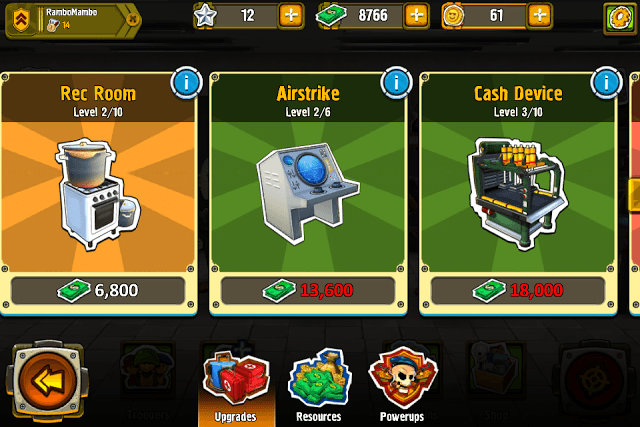 You will find room upgrades in Shop, so no need to tap on each room to upgrade them. Upgrading Rec Room will allow you to add more troopers to your squad and increase your army size. Exercise Machines: Training takes time, so why not train more troopers at once? You can do this once you have upgraded Exercise Machines at the Shop. Upgrading Armory frees up more space in your Armory so that you can store skills and weapons that you have discovered in your trooper’s inventory or as battle reward. Usually the inventory has identical weapons or skills which can be dragged and dropped to upgrade your primary weapon or skill, but sometimes you may get something new, which you can store in the Armory so that you can use it or equip it in future. Tap on your soldier and then drag the newly discovered skill or weapon and its duplicates from the inventory to the armory. You can find a trooper’s armory just beside “Stats”. This will free up space in the Inventory, which then will allow you to find more weapons/skills using stars. Airstrike is an important power-up that can deal damage to multiple enemies. Upgrading it will increase damage and the number of airstrikes per battle. Available in battle and can be used to heal troopers. Use this on a trooper with low HP. Make sure you use it before a trooper gets unconscious. Upgrading First Aid Kit will increase the number of heals per battle. Upgrade this to bring an unconscious trooper back in action on the battlefield. Upgrading it will increase the number of resuscitations per battle. Use this power-up in crucial times or right before the final stage of a battle. You receive stars after finishing a solo or PvP battle and get more if you win one. Stars are used to get skills and weapons from the inventory. Tap on a soldier and then tap on a star in the inventory to get a random weapon or skill. Stars are precious, so don’t use them only on one soldier. Allocate stars on each trooper in your squad. If you have used two stars to find weapons/skills for one soldier, use the other two for another trooper and so on. This way you will be able to find and equip weapons and skills for all soldiers in your squad. Airstrike can be extremely useful to deal damage to multiple enemies. Use it at the final stage of a single-player battle, where you may encounter a mini-boss. Each battle has a boss stage, where a more powerful trooper will try his best to eliminate your soldier. Tap on Airstrike and tap on the mini-boss. An airstrike will hit him and surrounding enemies. Don’t forget to upgrade this ability via Shop. It will increase damage and will give more airstrikes per battle. Training your Pocket Troops boosts accuracy, boosts attack rate, and most importantly increases health and armor. Before heading out to battle, make sure you train all soldiers of your squad. Don’t forget to upgrade “Exercise Machines”. The more exercise machines you have installed in the training, the more soldiers can be trained at once. Go to shop and upgrade them, but make sure you have leveled up Cash Device first. As you progress, you will receive new skills or weapons from inventory or as battle rewards. You can replace old skills or weapons with newer ones or just store them in your armory for future use. However, many times you will want both old and new skills equipped to your trooper. To make this possible, you will need to unlock a trooper’s equipment slots. Play more PvP and single-player battles to level up your soldier. The weapon/skill slot will be unlocked once the soldier reaches a certain level. You can unlock a maximum of four slots and once a slot is unlocked; you can drag and drop a new skill to it. Sometimes, the enemy squad you confront will have fewer troops than your squad. In such situations, you can order more than one trooper to attack an enemy soldier. Use First Aid kit to heal a unit before attacking enemies. Once you have ordered targets and pressed the attack button, there’s no looking back. If your low-HP soldier gets hit by an enemy trooper, you can’t heal him, although you can use resuscitation to bring him back to life. Tap on the “Free Coins” button in your home screen to watch a video and earn a gold coin. Coins can be used to recruit special soldiers or speed up training. You can get 30 gold by logging in with a social network account. Tap on the envelope icon in your home screen to login to Facebook or Game Center and get your reward. Thanks for the advice. It was useful.